Goen South's third year in a row providing DMC services for this client proved to be bigger and better in Dallas. 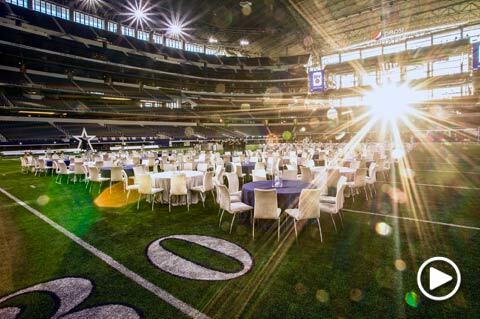 We assisted with general session seating, transportation, dine-arounds, an onsite 80s themed event, and the grand finale awards dinner at Cowboys Stadium. What better way is there to kick off the year than on the field of NFL legends? Meet & Greet Services, Ground Transportation, Dine Arounds, Event Planning, Onsite Coordination, Event Decor, Event Entertainment, Event Activities, Lighting, Special Effects and Police Escorts. The GKO & Leadership Meeting is Allscripts’ annual event. Allscripts provides innovative solutions that empower all stakeholders across the healthcare continuum to deliver world-class outcomes. Allscripts’ 2018 Global Kickoff (GKO) hosts over 600 employees, partners, leaders, and exhibitors from all over the world to build relationship and start a positive trajectory for the year. For the dine arounds, the goal was to keep people close, but separated and focus on local restaurants. For their onsite event, the client wanted laid-back vibe and fun, interactive atmosphere. The onsite event was typically the most impressive event of the conference, and the goal for this year was to outdo ourselves once again. For the offsite event, the client wanted the venue to have a WOW factor and for the venue to align with the brand as well as provide ample branding opportunities. The client’s original vision for the awards dinner was a quintessential “Dallas” themed event with big hair, cowboy boots, and country music. This vision changed as the host hotel didn’t have a space big enough that would allow our team to create a unique event onsite. In the past, the group stayed together for the dine-arounds. Guests typically stayed at resorts outside the city, and shuttles were provided throughout the night in case guests wanted to explore downtown. The 2018 conference was in the city center of Dallas, so it was much easier for guests to explore the city. With more high-level salespeople in attendance this year, the client wanted to focus on giving everyone a more individualized experience. 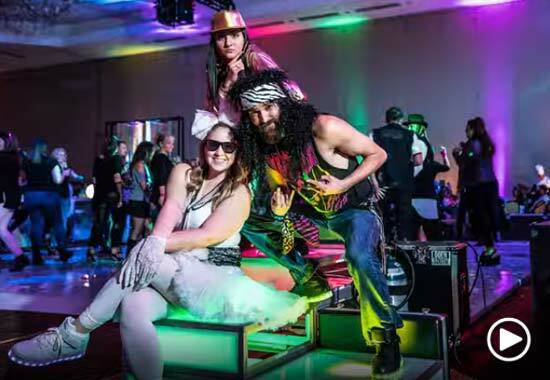 For the onsite event, we suggested a funky 80’s rock ‘n roll theme to differentiate this year’s event from the 2017 event. We transformed the entire space with décor and interactive entertainment. The grand entrance featured rock n’ roll props including a drum set, keyboard, guitars, and equipment boxes, plus trussing elements accented with uplighting. Inside the ballroom we created vignettes using oversized guitars. A central LED bar featured a fabulous slinky chandelier overhead. Funky, colorful lounge furniture peppered the space, and a mix of round and white communal tables featured black sequin linens and retro printed black and white linens. The centerpieces included ice sculptures with an assortment of vintage album covers, round silver drums with floral and music inspired elements, and fiber optic fans for the hiboy tables. Guests came dressed to impress with clothing and hairstyles straight out of the 80’s, but we also provided a prop station. A gaming lounge featured old-school arcade games like Pac Man, Donkey Kong, and Frogger that had guests trying to beat each others’ high scores. The highlight of entertainment was centered around our LED dance floor where guests danced the night away to a live 80’s cover band. 80’s music videos played on the existing screens to inspire guests to get their groove on. The coolest element on the stage was our CO2 Cryo Gun which provided an infusion of energy for guests on the dance floor. The 80’s were the perfect theme for this fun-loving group; everyone was able to let loose, which was exactly what the client was hoping for. The highlight of the conference was the final night. Guests boarded the motorcoaches with excitement. There was lots of speculation, but no one knew for sure where they were going. To add to the anticipation, police escorts made guests feel like VIPs as they drove, light flashing and sirens wailing, at the front of the transportation caravan. We knew rush hour traffic would be a concern, and the police escorts added excitement and cut down on transit time. The motor coaches were able to drive all the way into the stadium inside the concourse, so guests exited the buses and walked directly onto the field. This was a truly special moment, and the surprise on the guests’ faces reconfirmed our decision to keep the venue a secret. As guests entered the field, they walked under the perfect photo op: a giant Dallas Cowboys star. A live feed showed guests’ faces throughout the night on the giant diamond vision board. The client’s brand was featured on all the ribbon boards throughout the venue. It was the ultimate VIP entrance. The excitement didn’t end here. Guests were able to put themselves in the shoes of NFL players with fun games where you Punt, Pass, Kick, Catch and Run. An official timer on one of the big screens kept score. 20 game attendants ensured everything ran smoothly. Our engaging DJ/Emcee kept the party hopping with high-energy music; he also made announcements encouraging guests to participate in all the activities and provided support for the awards ceremony. The client didn’t originally plan to have a stage, but added one at the last minute, so our team scrambled to decorate the stage with silver drapery. As guests received their awards, their names were displayed up on the ribbon boards.